With over 100,000 copies sold since first publication, this is one of the most popular astronomy books of all time. It is a unique guidebook to the night sky, providing all the information you need to observe a whole host of celestial objects. With a new spiral binding, this edition is even easier to use outdoors at the telescope and is the ideal beginner's book. Keeping its distinct one-object-per-spread format, this edition is also designed for Dobsonian telescopes, as well as for smaller reflectors and refractors, and covers Southern hemisphere objects in more detail. Large-format eyepiece views, positioned side-by-side, show objects exactly as they are seen through a telescope, and with improved directions, updated tables of astronomical information and an expanded night-by-night Moon section, it has never been easier to explore the night sky on your own. Many additional resources are available on the accompanying website, www.cambridge.org/turnleft. Philip's Month-by-Month Stargazing 2016 is a concise guide to the northern-hemisphere night sky, helping starwatchers to see the year's most fascinating events, whether observing with the naked eye, binoculars or a telescope. New for 2016, the authors have included ideas for joining Citizen Science projects at the cutting edge of astronomical research. The guide is suitable for use between latitudes 40°N and 60°N, including Britain and Ireland, Europe as far south as Rome, and Canada and the northern USA as far south as Philadelphia. The Solar System Almanac explains the movement of the planets, with particular attention paid to their positions in 2016. Solar and lunar eclipses, meteor showers and comets are also described. Previously entitled Collins Pocket Guide Stars and Planets, this classic guide to the night sky enters its fourth edition as part of the authoritative Collins Guide series. A comprehensive guide to all the stars and celestial objects visible with the use of binoculars or an average-sized telescope, this fully revised edition features updated and extended text, improved sky charts, and new diagrams and photographs. In addition to the charts and diagrams, the text is accompanied by many photographs throughout, making this the most practical and comprehensive guide to the night sky. Many people dream about exploring the heavens with a telescope but are often disappointed because they do not know how to use one properly. 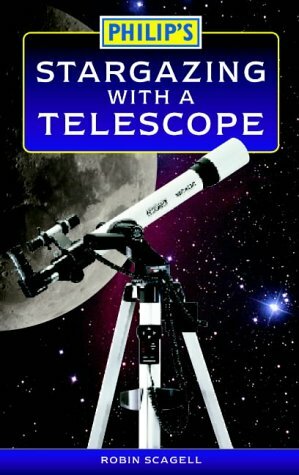 This guide reveals what to expect from a telescope and how to choose the right one, and gives explanations of how they work, and how to progress from first-time user to hobby observer. It gives practical help for setting up and using any telescope, and provides lists of objects to look at with different sizes of telescope, from both town and country, including the Sun, Moon, planets, comets, asteroids, stars, clusters, variable stars, double stars, novae and supernovae, nebulae and galaxies. Thia is a brilliant atlas in full colour, with all objects colour-coded for easy identification, being spiral-bound it is easy to use when out on location and all the pages are marked like a road map with pointers to the next page in the sequence. Great for the visual observer who wants to learn how to star-hop to find objects. 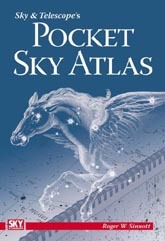 This atlas is great for the deep-sky observer, with star clusters, galaxies and nebulae well defined and easy to follow. It also has some close up maps of the Orion Nebula, Pleiades and Virgo Galaxy cluster etc. As a visual observer you will find this atlas indespensible. Swindon Stargazers welcomes new people to amatuer astronomy and this page and others will hopefully set a few pointers on what the hobby is all about. It may seem quite daunting entering the new and exciting world of astronomy but one of the club's priorities is to help new beginners find their way both around the hobby itself, and around the night sky, which is both fascinating, and yet at the same time dark and mysterious. We are helped a great deal by the number of people interested astronomy, especailly in the Swindon and Wiltshire area, with a number of clubs and socierties dedicated to the hobby. The other thing is that the revolution of the Internet has helped us find out a great deal more about the stars and planets by giving the opportunity to access a huge amount of information, and at the press of a button, for example, we can tap into the huge resources of the Hubble Space Telescope or the NASA website. If there is anything you would like to see or learn more about on these pages, then email by using the link below, and we will see what we can do! In the meantime this web page offers some hints and tips, especially to those new to the club, or to astronomy, on some of the common tools of the trade. Some books are also recommended. In the first instance it must be remembered that astronomy does not have to be expensive. A good quality pair of binoculars can be picked up for under £50, and can be the gateway to many a fine viewing, especially those objects such as Comet Lulin, whose trajectory is hard to pick up and you need to search a lot of sky with ease. The Helios Fieldmaster 10x50 Porro Prism is a good example for astronomers, as is the Celestron Skymaster series. If you want to mount the binoculars be sure to choose a pair that has a tripod adaptor. Small refracting telescopes are the next best option as these can be quite reasonable for a 90mm scope, Meade offer this type of scope for around £200, and the price includes a 'Goto' computerised handset to help you find various objects in the sky. This is great if you are new to the hobby, but should only be used as a guide, though with 30,000 items in its program memory you are spoilt for objects to view! After this there are many fine telescopes on the market from the likes of Meade, Celestron and Skywatcher, and if you are thinking of going a step further, the best thing to do is seek advice from club members and from specialist shops, such as First Light Optics in Exeter. Never go to a high street camera shop, the telescopes are often of inferior quality and you will not get the proper advice you deserve. Talk to the experts! Assuming you have a telescope, and that it came with a set of eyepieces, then below are some handy items that you could add to your hobby when you are ready. If you have a telescope with just two basic eyepieces, and would like to add more, here is the five basic recommended sizes for good viewing: 25mm; 20mm; 17mm; 12mm; 5mm. Basically, you start off with the largest aperture, the 25mm which has the wider field of view, then you go to a 17mm or a 12mm to take a closer view of the observed object. The Barlow Lens is probably one of the most popular items in the amatuer astronomers armoury. They come in two sizes (x magnification): 2x and 3x, the 2x being the most popular. All they do is multiply the magnification of the eyepiece you are currently using to view the stars, this can be handy when you have just a small collection of eyepieces that you bought with your first scope, say a 24mm and a 17mm. You just insert the Barlow Lens into the scope once you have found your veiwing object and then insert your standard eyepiece on top. 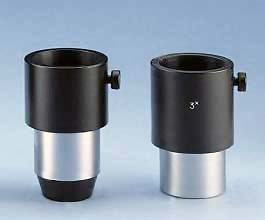 The Barlow Lens is also used by many experienced astronomers. The items illustrated are Tal 2x and 3x Barlows and available from First Light Optics for £29 (2x) and £34 (3x). The 2x is particularly recommended. I picked up a handy tip on how to convert a x2 barlow into a x3 or x4. You basically just need to move the eyepiece away from the barlow. I use a cheap barlow that came with my table top Skywatcher, having unscrewed the lenses from it, leaving just a tube. I can then use this tube as a spacer between the barlow and the eyepiece, giving me about x3. That means my 12mm F/L eyepiece becomes about a 4mm F/L (12 / 3) which means magnification for my 1000mm F/L scope is 1000/4=250 times. Thats about as high as I can push my scope, but the seeing must be very good to use it at that. Some of you may also have a Focus Extention Adaptor, these come in various lengths could also be used to extend a Barlow. These color telescope filters are the most important filters. If you buy no other filters, buy these! This 1.25" Set of Four Orion Color Telescope Filters includes a new foam-lined hard case that holds all four filters! MANY ARTICLES in Sky & Telescope and SkyWatch Magazine introduce the basics of backyard astronomy to new and aspiring hobbyists. Here are some features from past issues to help you make the most of your time under the stars.